Panto has finally found its feet in the vast and challenging space of Derby Arena. Derby LIVE has brought in the thoroughly experienced and locally based Little Wolf Entertainment, used a live band (“the only working pit in the Midlands”) and made the scale of the place work with them rather than against them. The Arena is a velodrome. So the writer, Morgan Brind, introduces some cycling and opens his Beauty tale at the close of the Tour de France, with the obnoxious Gaston (Aston Dobson) the strutting victor. Brind himself as Betty Brioche is a magnificent Dame, as dotty as they come, inventively costumed and commanding the stage throughout. 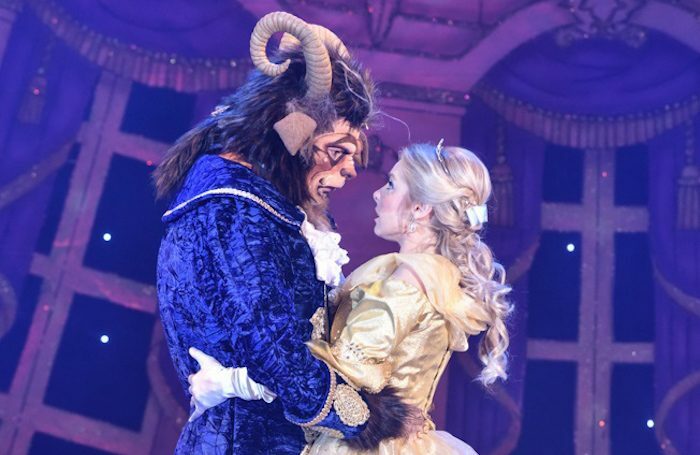 It’s a fine and strong-voiced cast altogether, with Derby’s own Gwen Taylor as the wicked Enchantress, Ben Faulks as an endearing Idle Jacques and Louise Olley as a sweet but never saccharine Belle. Nathan Turner’s Prince Philippe gets to fly for a breathtaking transformation scene. The set is a glittering fairy-tale castle on the revolve, there are spectral dancing gargoyles, squirty cream for slapstick, and an unflagging stream of good jokes. Best of all, this is an audience being inducted into the ways of panto. It’s lovely to see.